Now In: Generic Mfg → Straight Steer --The Original "Straight Steer"!! Don't be fooled by cheap pirated copies, that claim improvements on our design, this is total BS. This is the original proven steering brace that will help the handling of your Scout! Does it feel like you're herding your vehicle down the road instead of driving?? The cause of much of your tracking problems may lie in the fatiguing of the frame at the steering gear. The stress loads caused by the way the engine mounts to the frame and those imposed by the steering gear over the past 15-20 years or so results in fatigue of the frame to the extent it becomes an unsturdy mount. To check this, have someone turn the steering wheel and watch the steering gear (it will probably wobble). Also, if you experience major handling problems in a crosswind, this may be your problem. 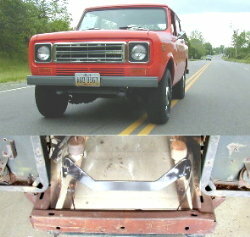 The "Straight Steer" Brace eliminates this problem by stabilizing the mounting of the steering gear. Improving handling to the point you will be able to tell if the steering gear is worn. 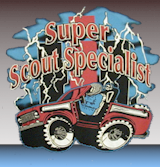 SSS purchased the original tooling and name from the original inventor Mike Svenson. 1) Remove nuts from the two front bolts on the steering gear. 2) Remove reinforcing channel and save. 4) Position brace between frame rails and align with exsisting holes in opposite rail. 5) Use reinforcing channel that was saved, on the outside of opposite rail. 6) Torque 4 new bolts & nuts to original specs. 7) Go for a drive & relax while doing it!